OCALA, FL (February 23, 2011) - What do you get when you mix beautiful weather, talented horsemen, first-class facilities, exciting events and fabulous prize money? The answer is simple: HITS Ocala! The Ocala Winter Festival marked the second AA rated week of show jumping in the 'Sunshine State'. The two Grand Prix and weekly Devoucoux Hunter Prix saw record-breaking entries this week. In Thursday's $25,000 SmartPak Grand Prix, presented by Pfizer Animal Health, Kent Farrington of Chicago, Illinois, emerged as the winner out of what was then a record 48 starters, aboard Up Chiqui, owned by William Dobbs, Alex Boone and Farrington. 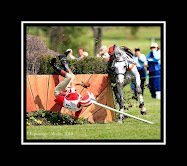 Thursday's track proved challenging, as only five returned for the jump-off. Sunday's $50,000 class set a new record three days later with 50 entries, as Andre Thieme of Germany and Cesar won their first Grand Prix of the season. Despite the bigger entries and challenges on Sunday's course, 12 talented teams advanced to the jump-off for an exciting conclusion. 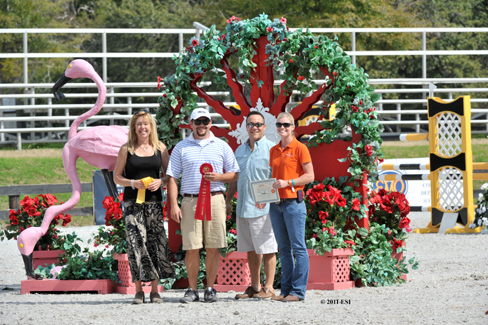 Thieme also picked up the third place ribbon aboard his own Uvalier, while German native Matthias Hollberg, now of Apex, North Carolina, was second aboard Apex Equestrian Center's Wadisson. Both Farrington and Thieme are aiming to qualify for the 2011 Pfizer $1 Million Grand Prix on September 11 in Saugerties, New York. Kent Farrington and Up Chiqui on course in the $25,000 SmartPak Grand Prix, presented by Pfizer Animal Health. 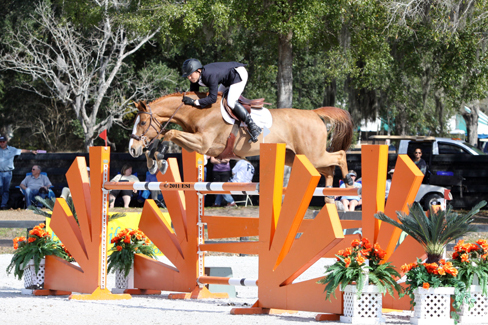 Andre Thieme and Cesar on course in the $50,000 HITS Grand Prix, presented by Pfizer Animal Health. HITS' Lisa Engel, Dr. Andy Clark (CEO of Hagyard Veterinary), Dr. Heather Woodruff and Ms. Arwen Price, all on behalf of presenting sponsor Pfizer Animal Health, presented the awards and a cooler courtesy of Shires Equestrian Products to Andre Thieme and Cesar in the $50,000 HITS Grand Prix, presented by Pfizer Animal Health. Thieme also received a bottle of chardonnay courtesy of Sonoma-Cutrer Wines. The Devoucoux Hunter Prix has been the premier hunter event each week throughout the circuit, and Sunday's outstanding $10,000 event showed just how eager the hunter riders are to qualify for the Diamond Mills $500,000 3'3" Hunter Prix Final on September 10-11 in Saugerties, New York, as 70 riders tracked the course. Standing tall at the end of the $10,000 Devoucoux Hunter Prix was High-Performance rider Tracey Fenney of Flower Mound, Texas. 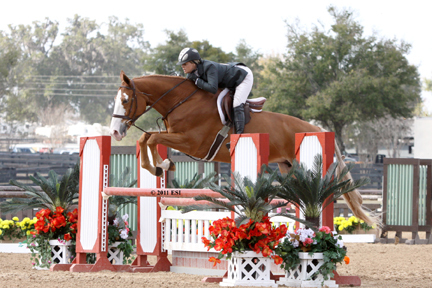 Fenney, who is one of the all-time leading Grand Prix riders at HITS Ocala, was delighted to show her skills in the hunters aboard Mr. and Mrs. Ken MacKenzie's MTM La Costa. Second place was awarded to standout junior Meg O'Mara aboard Walk the Line, owned by Don Stewart and O'Mara. 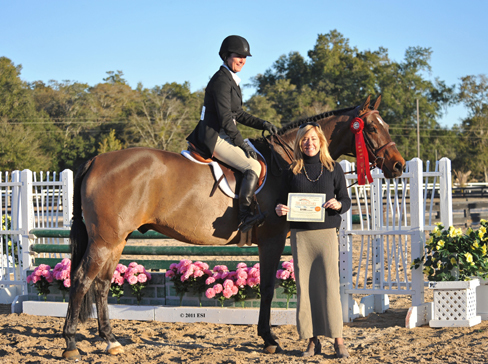 The duo had a successful week at the Ocala Winter Festival, picking up two first place ribbons in the Large Junior Hunter 16-17 division, which helped earn them the Reserve Champion honors. 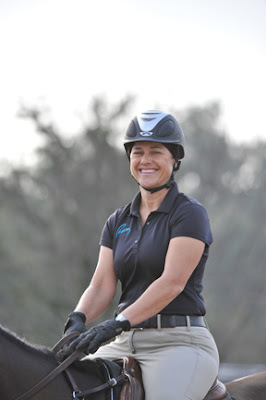 Rounding out the top three was professional rider Kate Conover of Ocala, Florida aboard Doreen Toben's Black Tie Affair. 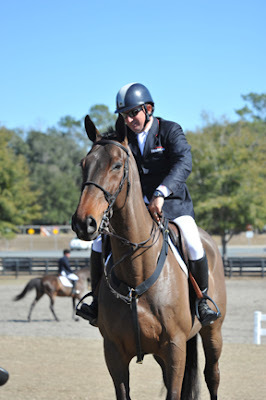 Tracy Fenney and MTM La Costa on course in the $10,000 Devoucoux Hunter Prix. Meg O'Mara and Walk the Line on course in the $10,000 Devoucoux Hunter Prix. 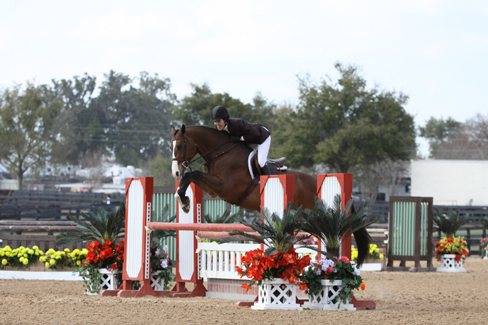 Hunters are an art; and High-performance riders Megan Edrick of Ocala, Florida and Aaron Vale of Morriston, Florida painted a perfect picture in the Kinsman Farm Thoroughbred Hunter division. This new exciting division is limited to Thoroughbred horses with fences set at 3'. Edrick and Lynn Seithel's Miss American Pie were crowned Champion in the division, while Vale and Frances Robinson's Geoffery's Mon took home the Reserve Champion honors. Vale added to his ribbons, as he picked up an 11th place finish in the $25,000 SmartPak Grand Prix, presented by Pfizer Animal Health aboard Joan Kalman's Highlander, as well as a fifth place finish aboard Walter Ulan's Quito and 10th place finish aboard Highlander in the $50,000 HITS Grand Prix, presented by Pfizer Animal Health. The $7,500 U-Dump Junior/Amateur-Owner High Classic took place Sunday, and Amateur rider Laura Linback of Mundelien, Illinois, aboard Woodrun's Casino took home the blue ribbon and $2,250 in prize money. Second place and the The Sanctuary Reserve award was presented to Michael Hughes of Allendale, New Jersey and Shockwave, owned by Drumnacross Farm LTD. Hughes, one of the most talented junior riders in the country, is consistently in the winner's circle each week and also picked up the second and third place ribbons in Sunday's $5,000 Junior Jumper Medium Classic, aboard Wullisina and Red Hot, both entries of Drumnacross Farm, LTD, respectively. Jeremy Raleigh accepted The Sanctuary Reserve on behalf of Michael Hughes. HITS' Lisa Engel, U-Dump's Joe Marotta and Nikki McDaniel of The Sanctuary presented the award. One of the most exciting Grand Prix weeks in HITS Ocala history has had a huge impact on the Pfizer $1 Million Grand Prix standings. Leading the way in the standings is HITS Thermal competitor Rich Fellers of Wilsonville, Oregon and Flexible with $28,300 in winnings. Tracy Magness of Hughsville, Maryland, a HITS Ocala competitor, and Tarco Van Ter Moude, are in second place with $23,750. 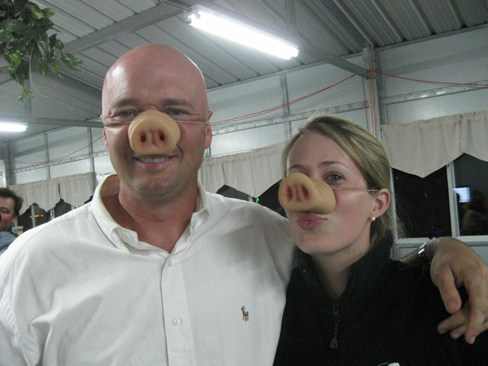 HITS Thermal's John Pearce, a Canadian Olympian, and Son of a Gun round out the top three with $22,370 in winnings. After last week's competition, Andre Thieme and Kent Farrington have made their presence felt in the Rider Rankings. Thieme broke into the ten while Farrington entered the rankings for the first time. 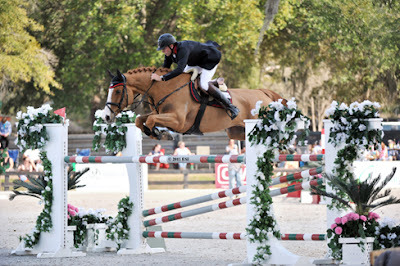 With eight Grand Prix remaining at HITS Ocala, including the big ticket $100,000 DeLuca Toyota Tundra Grand Prix, presented by Great American Insurance Group, for some new names to break their way into the rankings. The standings for the Diamond Mills $500,000 3'3" Hunter Prix Final are also beginning to take shape as record entries filled the weekly Devoucoux Hunter Prix qualifier. Leading the way in the standings is Hope Glynn of Petaluma, California, aboard Chance of Flurries with 153 points. Second belongs to Cathy Inch of Chelmsford, Ontario, Canada, and Rainier with 135 points, while Callie Morgan Smith of Bernardsville, New Jersey, rounds out the top three with 129 points with Sagaro. After Sunday's $10,000 Devoucoux Hunter Prix, winner Tracy Fenney moved up to the sixth spot with MTM La Costa, with 101 points. For a complete list of the Rider Rankings, please click here. HITS Ocala's Cathy Inch and Rainier received the second place ribbon and Sanctuary Reserve award in the $2,500 Devoucoux Hunter Prix, at the Ocala January Classic. The weekly Odor-No-More Grooms Award was presented to Sarah Walley of Ledyard, Connecticut, who works for Solo Show Stables in Southern Pines, North Carolina. "Sarah works hard," said High-performance rider Harold Chopping of Southern Pines, North Carolina, who runs Solo Show Stables. "She's very deserving of this award, as are all of our grooms." 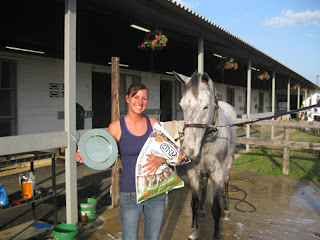 Sarah Walley was awarded the Odor-No-More Grooms Award. Missed the Grand Prix? That's OK! This season you can now watch every Grand Prix at HITS on Galopando TV at www.galopandotv.com, either live during the event or after the event for $5.00. 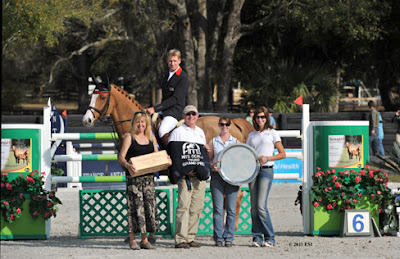 At any time throughout the year, viewers can watch select competitions from HITS Ocala. Last Monday, the Sanctuary Equine Sports Therapy and Rehabilitation Center hosted The Love of Your Horse Event. Located at 5590 NW Hwy. 225, The Sanctuary treated guests to demonstrations of their state-of-the-art equipment, information on equine podiatry, a special interactive panel discussion on lameness and rehabilitation as well as a special double lunging demonstration by Chester Weber and an opportunity to meet world renowned Seattle Slew jockey Jean Cruguet. 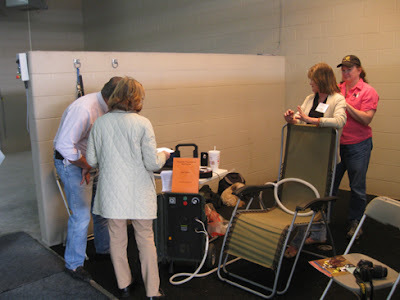 Guests received demonstrations of The Sanctuary's state-of-the-art equipment at The Love of Your Horse Event. On Friday, after a busy day of show jumping, the HITS Restaurant hosted a Mardi Gras Exhibitor Party. The fun-filled event featured food, music, and a costume competition. Taking home the Most Original Costume was Tammy Peterson of St. Louis, Missouri, dressed as a "Beauty Queen". Gavin Moylan and Alden Denegre show-off their snouts at the HITS Ocala Mardi Gras party. 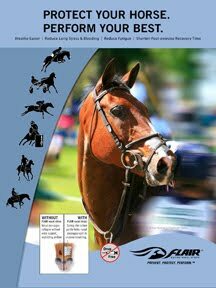 Arenus will be at HITS Ocala this week judging the Arenus Tack Room Award and selecting the winner of the Arenus Performance and Conditioning Award. You might want to contact Brickman Landscape to set your tack room up as a winner! Next up is the crowd-favorite World of the Horse event scheduled for this Sunday, February 27, at noon, prior to the $50,000 Strongid C 2X Grand Prix, presented by Pfizer Animal Health. Come and enjoy as numerous breeds of horses will be represented in a colorful parade, including special demonstrations. Can't make it? That's OK! Thunder Country WTRS 102.3 radio station will be on-site for a live broadcast, so tune in for complete coverage of all HITS happenings! The Ocala Masters began yesterday and has an exciting lineup of classes and events happening all week long. Starting on Thursday, the competition heats up as High-performance riders take the stage in the $25,000 SmartPak Grand Prix, presented by Pfizer Animal Health. Later in the week, the highly anticipated $15,000 Marshall & Sterling Children's/Adult Jumper Classic will take place Saturday night under the lights! Cody's Roadhouse, an official HITS VIP Restaurant, will be on hand all evening to cater guests at The Overlook Club watching all the action in the Grand Prix ring. Highlighting the week on Sunday will be the $5,000 Devoucoux Hunter Prix, the $10,000 Junior Hunter Classic, and the $50,000 Strongid C 2X Grand Prix, presented by Pfizer Animal Health. All Grand Prix and Devoucoux Hunter Prix events this season are qualifiers for the 2011 Pfizer $1 Million Grand Prix and inaugural Diamond Mills $500,000 3'3" Hunter Prix Final, respectively, which will take place September 10-11 at HITS-on-the-Hudson in Saugerties, New York.